I made a simple but significant improvement to my media cabinet. 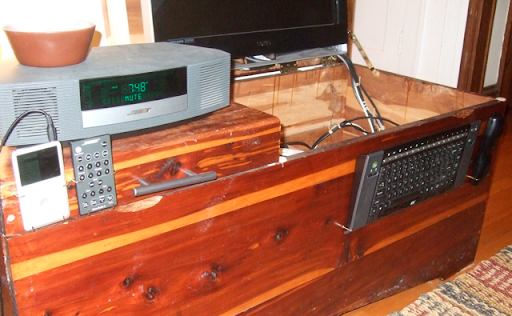 Inside the body of the cedar chest is a pair of flat panels which slide left and right on riders, allowing access to the bottom area of the chest but also providing a convenient place to keep the odds and ends needed for a media cabinet -- things like remote controls, Wii remotes, keyboards, thumb drives, hard drives, cameras, and USB cables. In fact the sliding panel is so convenient it became cluttered with too many things, each important enough to keep handy, yet the most important ones of all were lost amongst the others. At the same time, certain remote controls tended to float around the living room, or on top of the cabinet, or sometimes inside the cabinet, and that lack of a place to keep these oft-wanted devices has caused much gnashing of teeth and rending of clothes. 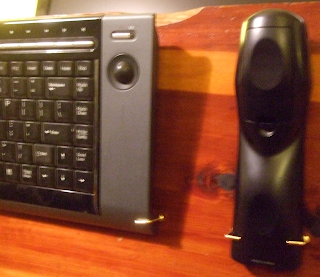 Using some recently acquired right-angle screw-in hooks, I formed braces for four devices which I often want to grab, but don't have a formal location to find them: the television remote control, the radio remote control, the iPod, and the wireless keyboard. The keyboard isn't in use these days, but it will be as soon as I buy some media server software, and it is awkward inside the chest. Critically, the keyboard is held surprisingly snugly by the two clips, which merely grab the bottom inch of the keyboard bevel. The television remote is similarly wedged. On the other hand, the iPod and radio remote slip loosely into slots formed by two hooks on the bottom and one on each side. I also found Datapro which manufactures custom one-off computer-port panels in any configuration. They are pricey, but might be perfect when I want to build the internals of this chest.